Synopsis: The son of a Jewish Cantor must defy his father in order to pursue his dream of becoming a jazz singer. Had Alan Crosland’s The Jazz Singer not been the first feature-length movie to feature spoken dialogue, it’s doubtful that it would be remembered at all today. But it’s impossible to over-estimate the importance of this otherwise corny drama in terms of cinema history. The release of the Jazz Singer on 6th October 1927 marked the beginning of the end of the silent era, and threw the movie industry into turmoil as studios and theatres began the lengthy and expensive task of converting studios and theatres to sound. 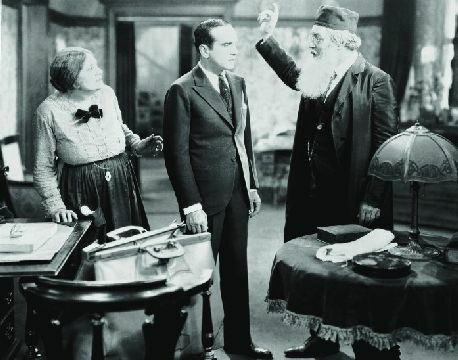 Careers that flourished during the silent era – including that of May McAvoy, who appears opposite Al Jolson in The Jazz Singer – faltered and die with the advent of sound. And, of course, the introduction of sound brought a whole new dimension to the movie-going experience. Al Jolson, who was at the time America’s biggest singing star, was the man upon whom the honour of delivering the first spoken lines was bestowed. He won the role only after George Jessel, who had played the role of Cantor’s son Jakie Rabinowitz on Broadway, turned it down after Warners refused to pay him extra for speaking on film, and although Jolson’s film career never really amounted to much, appearing in The Jazz Singer did at least prevent his star from fading in the way that Jessel’s subsequently has. Jakie ran away from his home in New York’s East Side as a 13-year-old boy after receiving a beating from his devoutly religious father for singing in a saloon, breaking the heart of his devoted mother (Eugenie Besserer) in the process. His father (Warner Oland) insisted that because the last four male Rabinowitz’s had been cantors, then the possibility of young Jakie being anything else simply wasn’t up for discussion. Some years later, Jakie (Al Jolson) is all grown up and earning a reputation for himself in California as a singer. He gives an impromptu performance at a restaurant in which he’s dining which is seen by rising Broadway star Mary Dale (May McAvoy), and he immediately becomes smitten with her. Mary is so impressed with Jakie’s performance that she puts him forward for the lead male role in her upcoming Broadway show. Of course, this means moving back to New York, and Jakie feels compelled to visit his old mum while he’s there. He entertains her with a few songs on the piano, but when his father returns home it quickly becomes clear that his attitude towards Jakie’s choice of music hasn’t changed and that, as far as he’s concerned, he has no son. After winning the part opposite Mary, Jakie learns that his father became unwell after their last meeting, and that he might even die. This means he won’t be able to sing at the synagogue on the Day of Atonement. The cantor’s friend, Moisha Yudelson (Otto Lederer) tries to persuade Jakie to sing in his father’s place in the hope that it might prompt a recovery, but Jakie’s new show opens on the very same night meaning that to do so would pretty much scupper his career before it’s even begun. Let’s face it: The Jazz Singer is a pretty corny movie even for 1927. Its story was one that had been done to death even back then, and the over-the-top sentimentality is difficult to swallow at times. It isn’t even a proper talkie, with much of the dialogue relayed through conventional inter-titles during lengthy silent sequences. And even when the sound does kick in during Jolson’s numbers you sometimes get inter-titles of dialogue spoken by characters as he sings so that, in effect, The Jazz Singer paradoxically becomes both a talkie and a silent movie at the very same time! However, it doesn’t take much imagination to appreciate what a thrill it must have been to those long-ago audiences when Jolson spoke his first lines. In that context, the quality of the story was of secondary importance, and no doubt audiences back then were far more forgiving than anyone watching it today. 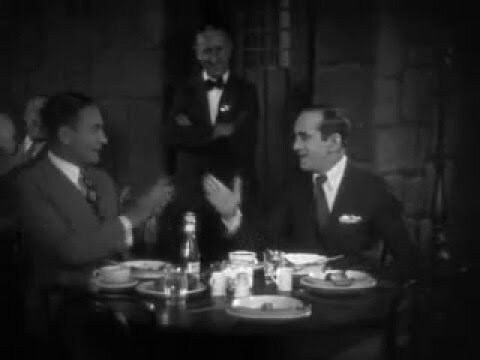 Perhaps surprisingly, Jolson gives a fairly natural performance in front of the camera, and receives strong support from McAvoy. Warner Oland also makes an impression as Jakie’s stern father – dispelling all memories of his more familiar guise as Charlie Chan – while Eugenie Besserer is appropriately endearing as Jakie’s saintly mother. Jolson wears blackface for the climactic scenes, which seems to be something that offends certain quarters. But the movie was made in 1927, when such racist practices were commonplace, and to pretend it never happened is to travel down a dangerous path where those who profess to care for our freedom want to control what we’re allowed to see. More offensive to me is the way in which the movie builds up this moral dilemma over whether Jakie should sing on Broadway or in the synagogue and then more or less ignores the supposed repercussions arising from whichever decision he makes. Jakie has his cake and eats it too, so what was all the fuss about?